Jeju's Inter-city bus is well organized and if you want to move via bus, it's good to experience Jeju's real life. I want to guide public transportation system in Jeju including Udo and I recently heard that it has been improved conveniently as more and more backpackers come to the island. Take No.100 in front of Gate 2 of the airport(10 min., 5 stops, 1,000 KRW). 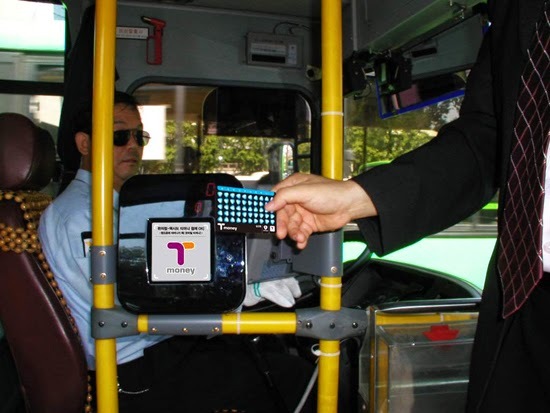 If you have T-money card, it's very convenient to pay and freely transfer between buses within 1 hour half minutes. 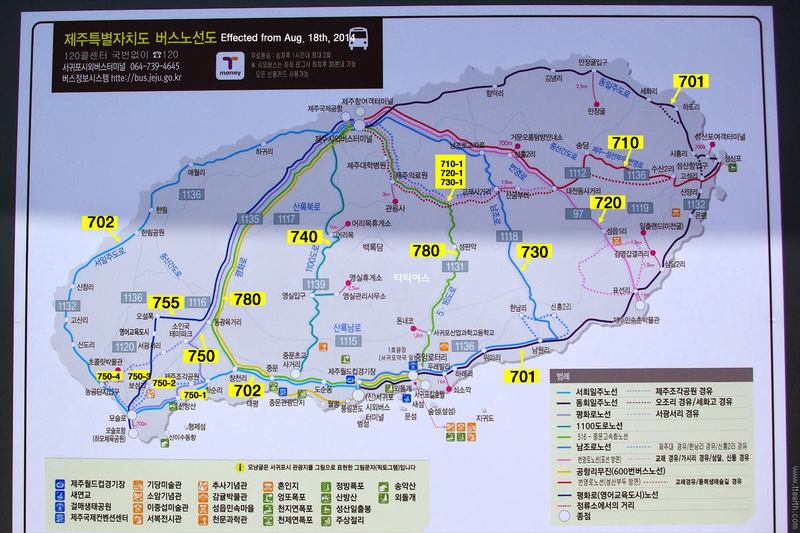 I want to guide how to use Jeju bus efficiently. Buy T-money card! You can buy any CVS with USD 2.5 and you can reload amounts you need. Saying your destiny to driver before paying. The driver make a fare for you, you can touch T-money card. Take No.740 at platform 2 of Jeju intercity bus terminal - It takes 40~50 minutes. Interval between buses : 20min. Take No.701 at platform 4 of Jeju intercity bus terminal. Estimated time from the bus terminal to Seongsan Illchulbong(off a bus at Seongsan-ri office) : 1hour 10min. Take No.710 (or 710-1 for Sangumburi Crater) at platform 5 of Jeju intercity bus terminal. Estimated time from the bus terminal to Seongsan Ilchulbong(off a bus at Seongsan-ri office) : 1 hour 10min. Estimated time from the bus terminal to Seongsan port : 1 hour 20min. Take No.780 at platform 6 of Jeju intercity bus terminal. Estimated time from the bus terminal to Mt. Halla(Seonpanak) : 30min. Interval between buses : 10 ~ 20min. Take No.780 at platform 9 of Jeju intercity bus terminal. Estimated time from the bus terminal to Jungmun Tourism Complex : 50min. Take No.730 at platform 7 of Jeju intercity bus terminal. Estimated time from Jeju intercity bus terminal to Seogwipo intercity bus terminal : 1hour 50min. Take No.750-1 at platform 8 of Jeju intercity bus terminal. Estimated time fro the bus terminal to Soingook them park(off a bus at Seogwang-ri) : 1hour 20min. Take No.702 at platform 11 of Jeju intercity bus terminal. Estimated time from the bus terminal to Hyeopjae beach : 1hour 40min. * All the bus fares can be paid by T-money(1,000 KRW to 3,000 KRW, depends on distance).